Diffraction from Materials provides the basic information concerning crystal symmetry, the kinematic scattering theory, as well as the physical properties of x-rays, electrons, and neurons. This book explores the crystalline nature of metals, semiconductors, and insulators. Organized into eight chapters, this volume starts with an overview of the basic ideas associated with the arrangements of atoms in crystals to help readers understand why diffraction studies are useful in learning about crystals. This book considers the analytical and geometrical methods to represent the symmetry relationships for the atoms in crystals. 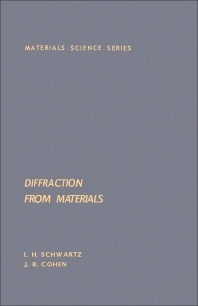 Other chapters examine the production of radiation suitable for diffraction from materials. The final chapter examines the various techniques for x-ray topography, including the Schulz technique, the Guinier and Tennevin technique, and the Berg–Barret method. This book is a valuable resource for electrical, civil, mechanical, and chemical engineers. This text will also be useful to materials scientists, chemists, biologists, and physicists. Chapter 7 What Else Can We Learn from a Diffraction Experiment besides the Average Structure?